Los Angeles County (incorporated as the County of Los Angeles) is a county in the U.S. state of California. As of 2010 U.S. Census, the county had a population of 9,818,605, making it the most populous county in the United States. The county seat is the city of Los Angeles, the largest city in California and the second largest city in the United States after New York City. 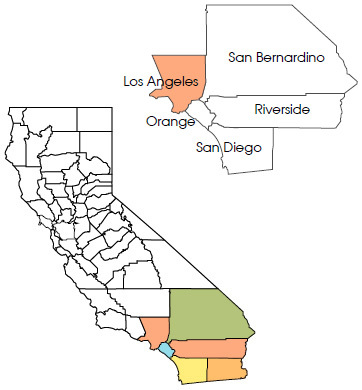 The county is home to 88 incorporated cities and many unincorporated areas and is home to over a quarter of all California residents. One of the most diverse counties in the country, it holds most of the principal cities composing the Los Angeles metropolitan area, and is the core of the five counties that make up the Greater Los Angeles Area. Los Angeles County is commonly associated with the entertainment industry; all six major film studios – Paramount Pictures, 20th Century Fox, Sony, Warner Bros., Universal Pictures, and Walt Disney Studios – are located within the county. Other major industries of Los Angeles County are international trade supported by the Port of Los Angeles and the Port of Long Beach, much recording production, aerospace industry, and professional services such as law and medicine. According to TNS Financial Services, Los Angeles County has the highest number of millionaires of any county in the nation, totaling 261,081 households as of 2007, with about 1 out of every 38 households worth more than $1 million (not including primary residence).